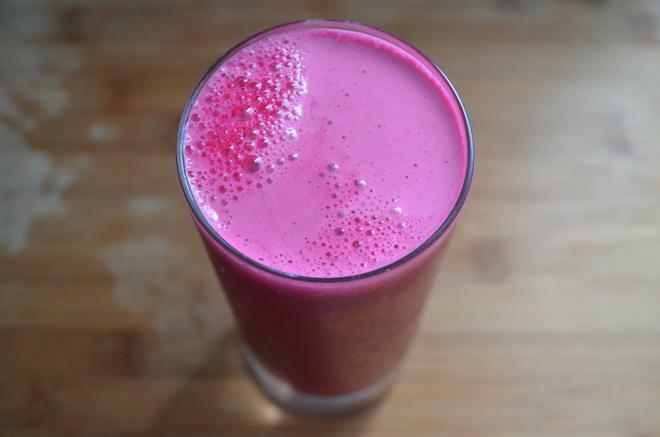 What Happens To Your Body When You Drink Beetroot Juice? Beetroot is widely used in culinary and is classified as a “super food”. Juice of raw beetroot contains a host of health benefits. Beetroots are great source of vitamins, minerals, antioxidants and dietary fiber. They are rich in vitamin C, manganese, folate, vitamin B6, betaine and potassium. Below are some great health benefits of drinking beetroot juice. Beetroot’s fibre and folate content helps in reducing the blood triglyceride and blood cholesterol levels. To get most of these benefits of beetroot juice, you must avoid straining the juice. Eating whole beetroot is more beneficial to make the most of cholesterol lowering abilities. Beetroots contain nitrates which are converted into nitrites by the salivary action, and these nitrites exert a blood pressure lowering effect. One study found that drinking one glass of beet juice lowered systolic blood pressure by an average of 4-5 points. Beetroot juice, and specifically the nitrate it contains, has been long touted for its heart healthy benefits. It helps the smooth muscles in the blood vessel walls to relax and widen, which dramatically reduces blood pressure, cutting the risk of heart disease and strokes. Beetroot juice is often recommended to increase hemoglobin levels in body. Hemoglobin is an iron-rich protein present in red blood cells that is responsible for carrying oxygen throughout the body. Hemoglobin in the body can be boosted by foods rich in iron. Beetroots are an excellent source of iron, beta carotene, folic acid as well as fiber and potassium. Its nutritional value helps increase the body’s red blood cell count. Beetroot juice known for decades as a liver-protective food. Betaine is nutrient present in beets that improves liver detoxification and promotes the flow of bile for better digestion. Daily intake of beetroot juice encourages liver cleansing, improves liver functioning and prevents liver diseases. The amazing detoxifying abilities in beetroot help in curing skin problems like acne, pimple and inflammations. Good amount of folate in beetroot fights wrinkles and keep the skin healthy glowing. Applying beetroot juice helps in refreshing and nourishing the skin and keeping it hydrated all day long. Beetroot juice contains carbohydrates, protein, potassium, phosphorus and calcium. All these nutrients are essential for healthy hair growth. Carotenoids in beet juice improve the quality, thickness and shine of the hair. It assists in blood circulation which nourishes the hair follicles, which in turn promotes hair health. Include fresh beetroot juice in your diet. Alternatively, grind a few beetroot (boiled in water) along with henna and apply the paste on your scalp. Leave it on for 15 to 20 minutes before rinsing it out. Next post: Why You Should Never Peel Off Apple Skins?